Before any hearts get completely shattered, as mine was upon viewing this video, the 356 appears to be a replica. Nevertheless, the story remains the same. 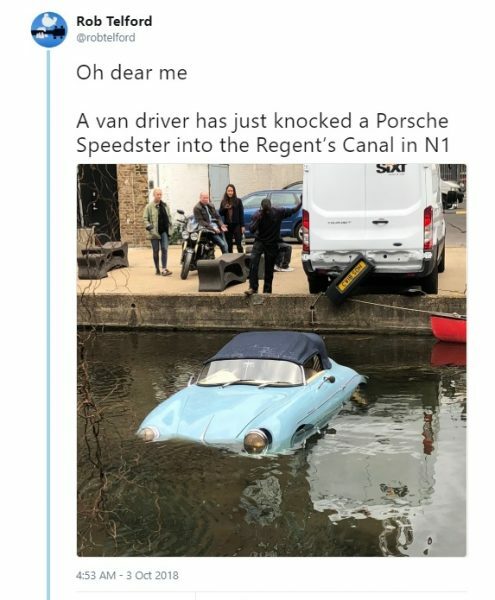 An inattentive van driver backs in to a space at speed, completely fails to notice the pale blue 356 Cabriolet already in the spot, and shunts the car into a canal. Given the van's speed it's likely that it would have entered the water, throttle still pinned, had the 356 not been there. If ever there was a case for back-up cameras, it's here. Independent publisher Unbound captured the video on their CCTV system. Rob Telford, a London photographer, documented the recovery efforts. The replica was apparently based on a 1980 Volkswagen Beetle, and was available for sale at a London dealer at the time of the accident for 30k GBP. Note the visible damage to the 356, and the missing plastic bumpers on the van. Recovering the car took several attempts using a roll-back tow truck. Given the state of the car, a crane may have been the more appropriate recovery vehicle. 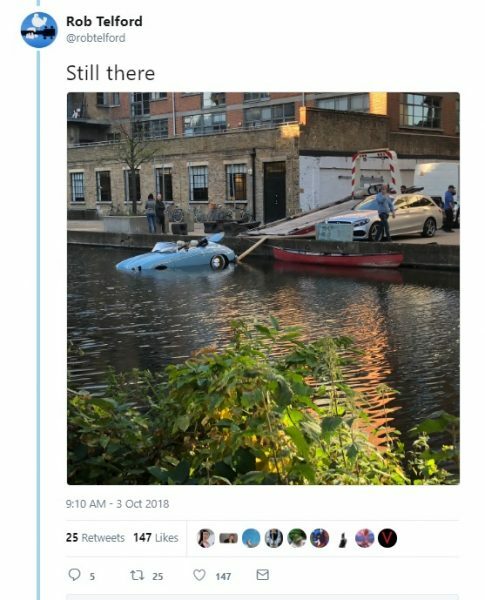 It appears that ultimately a pair of ramps and the winch from the roll-back sufficed to extract the 356 Replica from the water. Following its recovery, the car looks slightly forlorn with a drooping headlight. So far we have not seen good photos of the rear of the car showing the point of impact. The Chesil kits are fiberglass, like most 356 replicas. While fiberglass can be quite tough, it's likely it sustained some significant damage in the impact. Our sources have not yet confirmed, but rumor has it the van was just offered a position as kicker for the Cleveland Browns.